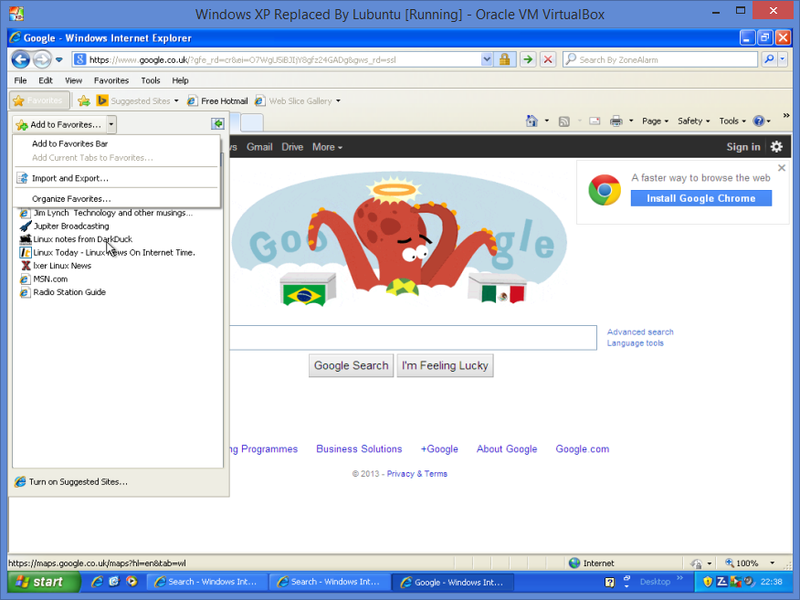 If you have read my previous articles then you will know that I started off by listing 5 reasons why Lubuntu is a good replacement for Windows XP and you may have read the alternative reviews that I listed and following on from that you may have tried out the live version of Lubuntu. The next step is to actually install Lubuntu but before you do you should perform the following 5 tasks first. Create a backup copy of your current Windows XP setup. Copy important files from your computer to external sources such as DVDs, USB drives, external hard drives and cloud backup services. Make sure you know all your usernames and passwords for all sites and applications you use. To export your Internet Explorer bookmarks open Internet Explorer and click on the Favourites icon in the top left corner (This assumes you are using Internet Explorer 8). Click on the “Add to favourites” option. Click on the “Export to a file” option and then select “Next”. Select “Favourites” and click next. If you have RSS feeds then you might like to export these as well. It may be possible to import these into Lubuntu as well. Select the top level folder or the folder full of bookmarks that you want to keep. Now select the folder and filename that you wish to call the export file. Click “Export”. After creating the bookmarks file it is now important to copy this off to a USB drive or to Dropbox. You will then be able to import the bookmarks into Lubuntu after you have installed it. When people visit websites they quite often choose to have their password remembered. This seems handy at the time but when you need to log in from another computer it is sometimes difficult to remember what the actual username and password is. As your Windows XP set up is likely to be set up to log in to various places automatically it is definitely worth making sure that you can remember the usernames and passwords to all the sites and applications that you use including iTunes, Amazon, PayPal etc. Make sure that the Lubuntu live disk works. If you are using a CD/DVD then make sure there are no scratches and that it reads properly. Make sure your computer is plugged in (laptops) so that the install doesn’t fail halfway through. The next article will show how to install Lubuntu 14.04. It has been a long time since I have used Windows XP. I have Windows 7 on a pretty new 64 bit laptop at work, and it actually works quite well. I have Windows 7 on a 2008-2009 vintage laptop at home; not so good at all. It works, but it runs like Molasses in January – it BARELY flows. When I moved to where I live now, I am near my mom and she had a nearly decade-old nice Dell Latitude D610 laptop, a really old beast, but a solid machine. I did, in fact, put Lubuntu, Linux Mint, Xubuntu, and finally antiX Base on it. Lubuntu and antiX have worked OK on it; frankly nothing is truly "fast" on that box, but Windows XP was nearly unusable. Now, though the machine is pretty aged, it still works. However, I bought my mom a nice Barnes & Noble Nook HD. It's a low end tablet, but it turns out that it's simple and perfect for mom. Once in a while, some video doesn't work right on it; then we get on the D610 and run antiX, but mom is more independent, using the Nook with very little assistance, whereas the D610 often needed my help, whether Windows, a *buntu variation, or antiX, though I got antiX Base closest to what was comfortable for mom because it's the most customizable; she didn't need to know how to install it, simply how to use it; I maintain her systems, and with the ones I've chosen, maintenance is very low and she's happy.